Take a trip to an island off the coast of Costa Rica in the Jurassic Park slot machine from Microgaming. The title has loads of great features and who doesn’t love anything relating to dinosaurs? Let’s take a closer look at it. Tones of atmosphere. The artwork and music certainly add a lot of suspense to the title. Loads of variety when it comes to bonus features. There are four different free spin games which give the slot lots of replay value. Fantastic animation. Each of the dinosaurs comes alive and interacts with the reels. Winning combinations also trigger movement from the low value symbols. Really confusing pay-out system. It’s hard for players to understand what they’ve actually won when they make a winning combination. The absolute top jackpot possible on this slot is 95,000 coins, won via the bonus features on the game. Mosquito amber “scatter” = 100x the total bet. Jurassic Park Logo = 26.6x the total bet. Dr Grant = 13.3x the total bet. Ellie = 11.6x the total bet. Hammond = 10x the total bet. Malcolm = 8.3x the total bet. 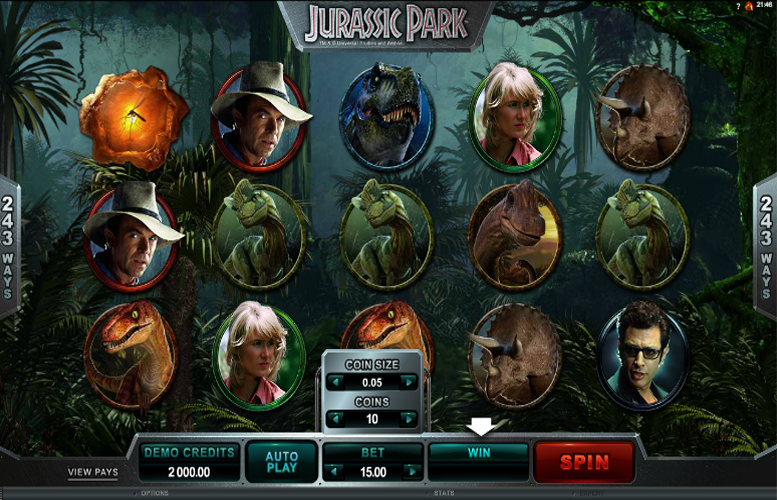 The maximum pay-out during the Free Spins mode on Jurassic Park is an impressive 380,000 coins. The mode itself is triggered by landing three, four, or five mosquito amber “scatter” symbols anywhere on the reels. Once activated, players are given a choice of which free spin mode they want to play. 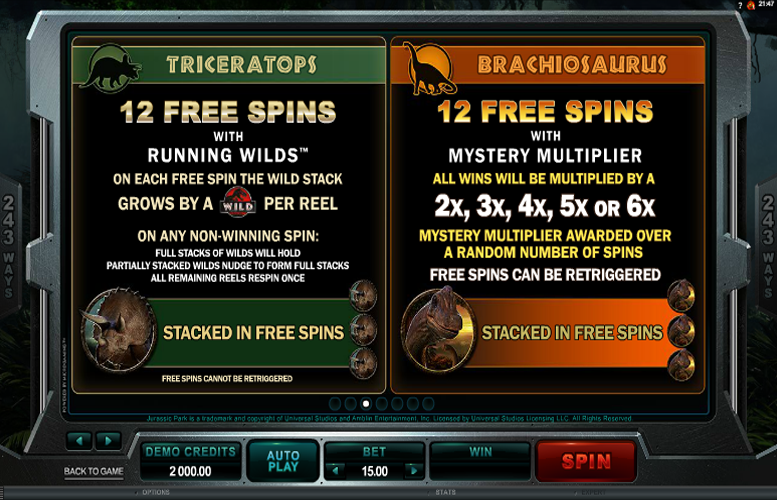 If players opt for the T-Rex Free Spins, they’ll be given 12 free spins with “wild” reels. During this mode, the T-Rex may appear and turn up to five reels “wild”. The T-Rex symbol also appears as a stacked symbol during the feature. These free spins cannot be retriggered. 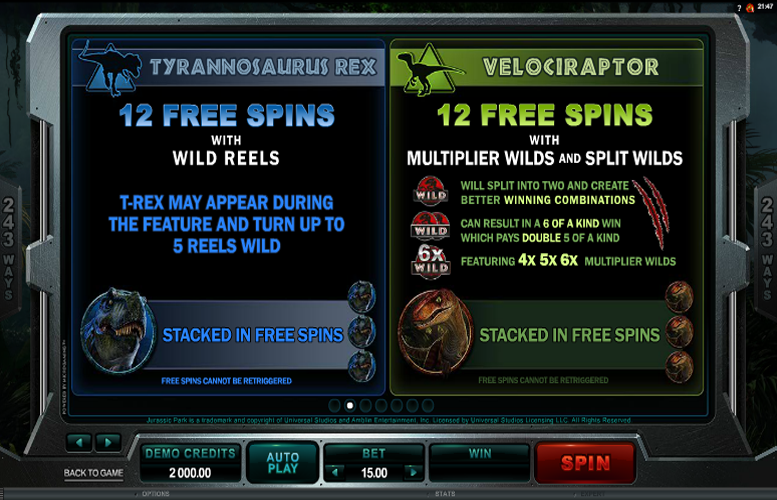 Like the T-Rex Free Spins, during the Velociraptor Free Spins, players are awarded 12 free games. This time, there are multiplier “wilds” and split “wilds”. Single Jurassic Park logos will be split into two to create better winning combinations. These can result in a six-of-a-kind win. This will pay double the quoted five-of-a-kind win. There are also 4x, 5x, and 6x “wilds”. Like the T-Rex symbol, the Velociraptor may appear as stacked during free spins. These free spins cannot be retriggered. 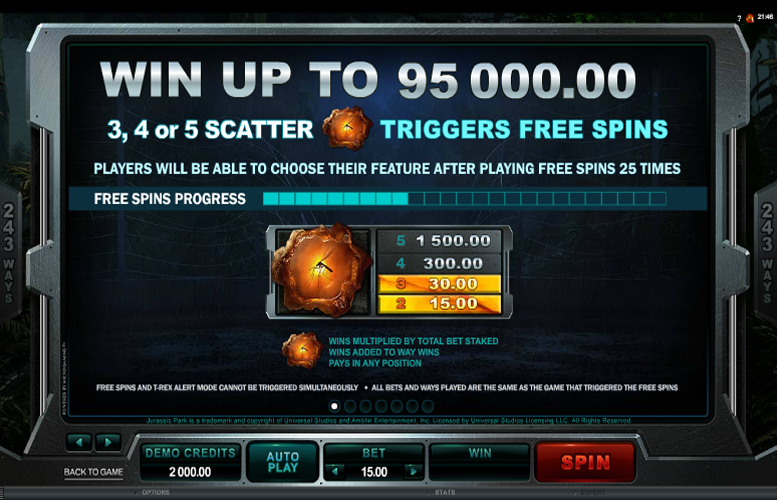 Again, the Triceratops Free Spins mode awards players with 12 Free Spins. This time, the special feature is running “wilds”. On each free pin, the wild stack will grow by a “wild” symbol per reel. On any non-winning spin, full stacks of “wilds” will hold. Partially stacked “wilds” nudge to form full stacks. All remaining reels re-spin once. Triceratops symbols appear stacked during the free spins. These re-spins cannot be retriggered. The iconic acid spitting dinosaur from the Jurassic Park movie also has a free spin mode on the machine. 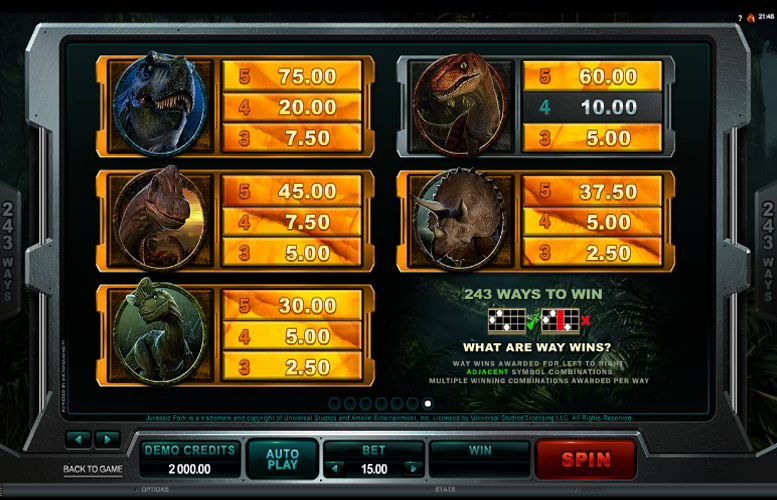 Again, during the Dilophosaurus Free Spins, players are awarded 12 Free Spins. This time, with winning “wilds”. The Dilophosaurus can turn random positions “wild”. Each “wild” will remain held and contribute to extra wins on subsequent spins. The Dilophosaurus symbol will be stacked during the free spins mode. The bonus cannot be triggered, however. When the Brachiosaurus Free Spins mode is triggered, players will receive 12 free games. These are accompanied by a mystery multiplier. All wins will be multiplied by a 2, 3, 4, 5, or 6x. Each mystery multiplier is awarded over a random number of spins. As with all the dinosaur free spins, the Brachiosaurus symbol is stacked during the round. Unlike the other modes, this bonus can be retriggered. T-Rex= 5x the total bet. Velociraptor = 4x the total bet. Brachiosaurus = 3x the total bet. Triceratops = 2.5x the total bet. Dilophosaurus = 2x the total bet. Despite there being no actual win lines on the Jurassic Park slot machine, the game plays as if there were 30. Players can adjust the number of coins bet on each of these supposed lines, as well as the value of each one. The minimum coin size is just 1p and the maximum is 20p. Meanwhile, they can opt between betting one and ten coins per spin. This makes the lowest bet per spin just 30p and the largest £60. Whilst this certainly won’t excite the highest rollers around, it will be more than enough for most players. 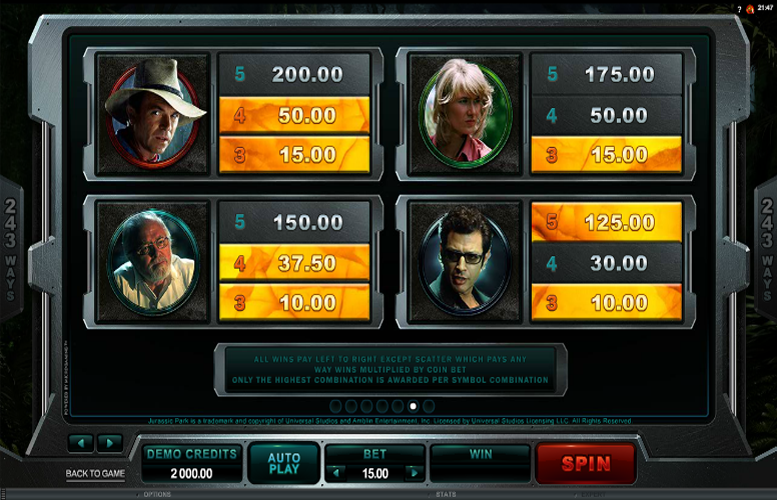 All told, the Jurassic Park slot is a solid offering that pays homage to a legendary action movie. There really isn’t a lot to dislike about the machine. It has a fantastic look and feel, as well as loads of great bonus features. One drawback of the game is how bizarre the pay-outs are on it. Using decimals to work out how much players are paid seems an incredibly convoluted approach to what is normally a simple part of a game’s dynamic. This game has a rating of 4 / 5 with 712 total reviews by the users.